• Can I order a custom seat belt length? Yes, but you will have to call in your order to add length or shorten seat belts or harnesses. • How do you measure the length of the seat belts? Seat belts are measured from end to end laid out flat. • What is the length of Individual Harnesses? Individual Harnesses reach a maximum of 52’’ and a minimum of 26’’ end to end. • Can you mix & match seat belts & harnesses? Yes, for instance you can order a bolt in seat belt with wrap around harness and bolt in sub belt. • What is a Latch & Link with Built in Latch Guard? This is also known as a Duck Bill Latch & Link. This has a pull down adjustment on the seat belts. The Duck Bill Latch & Link has the adjuster built into the Latch & Link which makes it very short coupled. Check photo on web page. • What is a Standard Latch & Link? 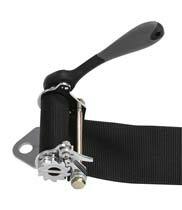 The Standard Latch & Link has 3-1/2" of webbing sewn between the Latch & Link and the adjusters. • What is the difference between a Standard Latch & Link and a Duck Bill Type Latch & Link?? A Duck Bill Type Latch & Link Lap Belt System features a built in latch guard with quick-release pull tab. Note: Adjusters are built into the latch & link system to accommodate applications with space restrictions. It is used on 3" seat belts ONLY. • What is the difference between the two Kam locks? One is a standard Kam lock where the adjuster is 13'' from the Kam lock. The other is our New Kam Lock with Aluminum Short Tang Adjusters 1.5'' from the Kam Lock. • What does Pull Down Adjustment on lap belts mean? This means the seat belt adjustment pulls down away from the body. • What does Pull Up Adjustment on lap belts mean? This means the seat belt adjustment pulls up toward the body. 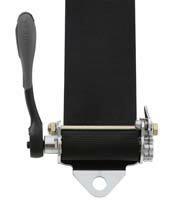 • What type of adjustment is on the Kam Lock Belts? Kam Lock seat belts are normally Pull Down Adjustment but can be made Pull Up on request. Special Lengths are also available. • Why use a sub belt (5th point)? Keeps your lap belts in place when you tighten your harnesses. • How should an Anti Submarine Belt be anchored? The 5 Point Anti Submarine belt should be anchored on or slightly behind the chest line. as measured from the intersection of the chestline and the lap belt buckle. • What size are the Eyebolts? Eyebolts size: 7/16 X 20 with 1-1/2" long shank. 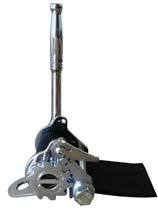 Eyebolts are furnished with all restraints that have floor mount ends. • What date is on the SFI Tags? SFI Tags are punched approximately 60 Days out. Example: If it is June 15th the date punched would be August. • What is a Ratchet Restraint? Lap belt ratchet’s are commonly used in off road racing, spring cars and other dirt racing applications. They allow the driver to tighten the lap belt as necessary. NOTE hand ratchet tool shown BUT NOT included. Available either right or left side, installation BOLT-in.